Probiotics – live bacteria with beneficial effects on human health – are believed to hold out great promise for certain therapeutic applications. But do these bacteria remain viable when they are frozen or freeze-dried for storage? Eawag’s expertise in drinking water microbiology enabled to it provide valuable support for a study of gut microbes carried out in the Food Biotechnology Laboratory at ETH Zurich. The composition of human intestinal flora has a significant influence on the immune system and digestion. In addition, changes in intestinal flora – also known as gut microbiota – have been observed to occur in the course of various intestinal diseases. Researchers are therefore investigating how microorganisms from the human gut could be used for therapeutic purposes. At the ETH Zurich Institute of Food, Nutrition and Health (IFNH), for example, doctoral student Lea Bircher’s recently published dissertation focused on the preservation of gut microbes. If these live microorganisms are to be used in medicine or as dietary supplements, they must not be damaged during storage. Bircher selected six functionally diverse bacterial strains and studied how well they survived storage for three months in a cryopreserved (-80°C) or freeze-dried state, with various protective agents being used to minimize damage. Frederik Hammes of Eawag’s Environmental Microbiology department supported this research project with his expertise in flow cytometry – an analytical method that allows microbial cells in drinking water to be quantified more rapidly than is possible with the plate count method or molecular biological techniques. 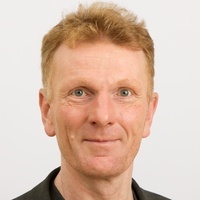 Frederik Hammes has been using flow cytometry in drinking and wastewater analysis for many years and has considerable experience with various methods of assessing the viability of bacteria in water samples. Bircher discussed with Hammes which of these methods would be best suited for assessing the viability of gut bacteria after preservation. 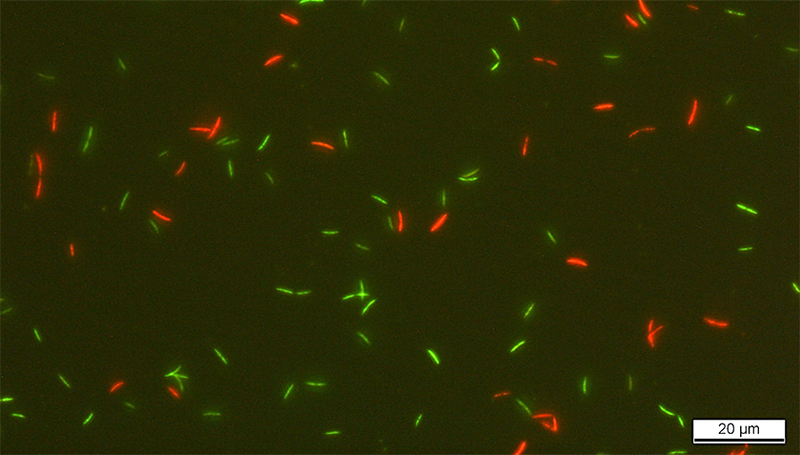 They soon decided that the bacteria should be stained with SYBR Green I and propidium iodide (SGPI), which makes it possible to evaluate the integrity of the bacterial membrane: in flow cytometric analyses, intact bacteria appear green, while red fluorescence indicates membrane damage. Underlying this decision was the fact that Eawag is particularly familiar with the SGPI staining protocol – the method was optimized for flow cytometry by Frederik Hammes’ group and was standardized in 2016. Test runs in the laboratory at Eawag confirmed its suitability for analysing the gut bacteria selected for the project. After learning the procedure at Eawag, Bircher carried out the flow cytometric analyses independently at the ETH labs. To assess the survival of the probiotics, Bircher examined cultures of the various strains before and after preservation. The SGPI method yielded valuable additional information on the viability of the samples. The addition of protectants such as sucrose, inulin or glycerol was found to enhance – sometimes markedly – the viability of the bacteria. However, individual protectants are not equally effective with all bacteria and preservation processes. All the bacteria selected by Bircher are regarded as particularly promising “next-generation” probiotics. However, numerous further tests will be required before these candidates are ready to enter the market. The collaboration between Clarissa Schwab and Frederik Hammes dates back to an Eawag conference held in 2015. Entitled “How Dead Is Dead?”, this event explored the limits of bacterial life: when is a bacterial cell dead, and how can this be determined? Bacteria can enter a resting state in which their metabolic and physiological activity is so low as to be no longer detectable. Can these cells be “resuscitated”? These questions have not yet been definitively answered – either in medicine or in drinking water microbiology. Lea Bircher's research was funded by the Swiss National Science Foundation (Sinergia 35150) and ETH Zurich. Strict anaerobic gut microbes have been suggested as 'next-generation probiotics' for treating several intestinal disorders. The development of preservation techniques is of major importance for therapeutic application. This study investigated cryopreservation (−80°C) and lyophilization survival and storage stability (4°C for 3 months) of the strict anaerobic gut microbes Bacteroides thetaiotaomicron, Faecalibacterium prausnitzii, Roseburia intestinalis, Anaerostipes caccae, Eubacterium hallii and Blautia obeum. To improve preservation survival, protectants sucrose and inulin (both 5% w/v) were added for lyophilization and were also combined with glycerol (15% v/v) for cryopreservation. Bacterial fitness, evaluated by maximum growth rate and lag phase, viability and membrane integrity were determined using a standardized growth assay and by flow cytometry as markers for preservation resistance. Lyophilization was more detrimental to viability and fitness than cryopreservation, but led to better storage stability. Adding sucrose and inulin enhanced viability and the proportion of intact cells during lyophilization of all strains. Viability of protectant-free B. thetaiotaomicron, A. caccae and F. prausnitzii was above 50% after cryopreservation and storage and increased to above 80% if protectants were present. The addition of glycerol, sucrose and inulin strongly enhanced the viability of B. obeum, E. hallii and R. intestinalis from 0.03–2% in protectant-free cultures to 11–37%. This is the first study that quantitatively compared the effect of cryopreservation and lyophilization and the addition of selected protectants on viability and fitness of six strict anaerobic gut microbes. Our results suggest that efficiency of protectants is process- and species-specific. The increasing use of flow cytometry (FCM) for analyses of environmental samples has resulted in a large variety of staining protocols with varying results and limited comparability. Viability assessment with FCM is in this context of particular interest because incorrect staining could severely affect the outcome/interpretation of the results. Here we propose a pipeline for the development and optimization of staining protocols for environmental samples, demonstrated with the common viability dye combination of SYBR Green I (SG) and propidium iodide (PI). Optimization steps included the assessment of dye solvents, determination of suitable PI concentration, and determining the optimal staining temperature and staining time. We demonstrated that dimethyl sulfoxide (DMSO) could impair membrane integrity, when used for SGPI stock solution preparation, and TRIS buffer was chosen as an alternative. Moreover we selected 6 μM as optimal PI final concentration: less than 3 μM resulted in incomplete staining of damaged cells, while concentrations higher that 12 μM resulted in false PI-positive staining of intact cells. Low temperatures (25 °C) resulted in a slow reaction and did not enable the staining of all bacteria, while high temperatures (44 °C) caused damage to cells and false PI-positive results. Hence, 35 °C was selected as optimal staining temperature. We further showed that a minimum of 15 min were necessary to obtain stable staining results. Moreover, we showed that addition of EDTA resulted in 1–39% more PI-positive results compared to an EDTA-free sample, and argue that insufficient evidence currently exist in favor of adding EDTA to all samples in general. Altogether, the data clearly shows the need to be careful, precise and reproducible when staining cells for flow cytometric analyses, and the need to assess and optimize staining protocols with both viable and non-viable bacteria. Gut bacteria Roseburia intestinalis stained with SYBR Green I and propidium iodide (SGPI). In bacteria with an intact membrane, only SG can penetrate and they thus appear green. If the membrane is damaged, PI also gets through, producing a red fluorescence.